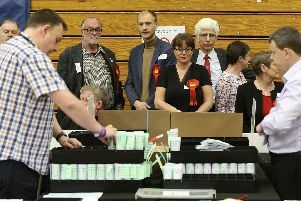 Labour leader Jeremy Corbyn is ‘selling out the British people by endorsing a plan to force a second EU referendum,’ according to Calder Valley MP, Craig Whittaker. In Parliament on Monday night (January 21), Mr Corbyn tabled an amendment asking MPs to formally consider holding a divisive second referendum, going back on the promise he made in his manifesto to respect the result. If a majority of MPs back a referendum, Parliament could force Theresa May to hold a new in/out public vote that could lead to Brexit being reversed. Mr Whittaker has criticised the Labour Party amendment, which is supported by Jeremy Corbyn. He said: "The people of Calder Valley, and the UK, voted to leave the EU in a historic referendum. "Politicians at the time, including Mr Corbyn, made it clear that this was a one-off vote and that the decision of the British people would be implemented. "It is Parliament’s job to honour the result of the referendum and to deliver Brexit in a way that protects jobs and businesses and which is in the national interest. "What we are seeing at the moment is a complete and utter abdication of responsibility by Parliament. Some MPs have no interest in delivering Brexit and are only interested in playing party political games and thwarting the process of leaving the EU. "A second referendum could fatally undermine faith in Parliament and in our democracy and would damage social cohesion by reopening divisions across the entire UK. It would create additional uncertainty and is not supported by the vast majority of the people of Calder Valley who just want Parliament to do its job and get on and deliver Brexit. "Jeremy Corbyn is selling out the British people by endorsing this plan to force a second referendum." "My Labour opponent has remained conspicuously silent on this issue throughout this whole debate. "It is time that he is finally upfront and honest with the people of Calder Valley about whether he supports his Party’s plan to force a second referendum which would take us all back to square one."